Beachrose Ramblings: A Kitchen So Good it's Fridaylicious! A Kitchen So Good it's Fridaylicious! Friday-licious Kitchen of the Week! Oh yeah, it's a Friday-licious kitchen for sure! 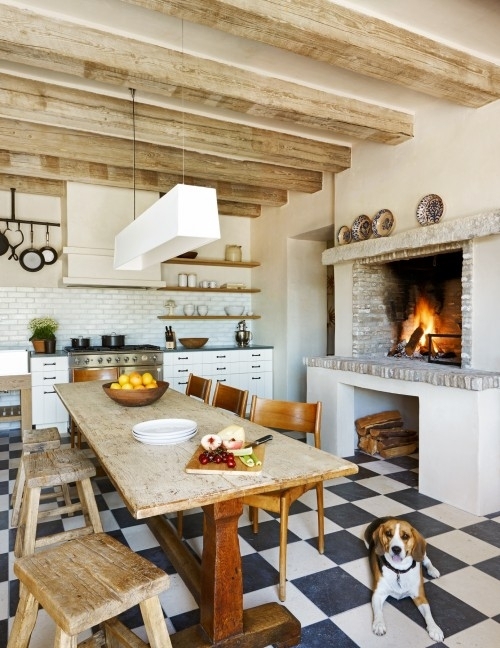 We are digging those gray and white checkerboard floors here at Beachrose Ramblings. Those floors contrast perfectly with all that aged and rustic wood everywhere -- on the overhead beams, on the wall shelves, and can I please just touch the patina on those distressed stools and tabletop? All of this is set against a marvelous creamy white background of painted cabinets, subway tiles, and walls. Oh, and don't get me started on that fireplace. It is, well, oh-so-perfect for cooking yummy wood-fired pizzas, or just plain old gazing at it, enjoying its' cozy warmth on a cold snowy night! I'm craving that stucco finish on it too. Of course, that perfectly cute little pooch-er-poodle tugging at this dog lover's heart had me at hello!